Question: Should I be worried about the possibility of lead in the sandbox toys (or on the playground) at my child’s school? 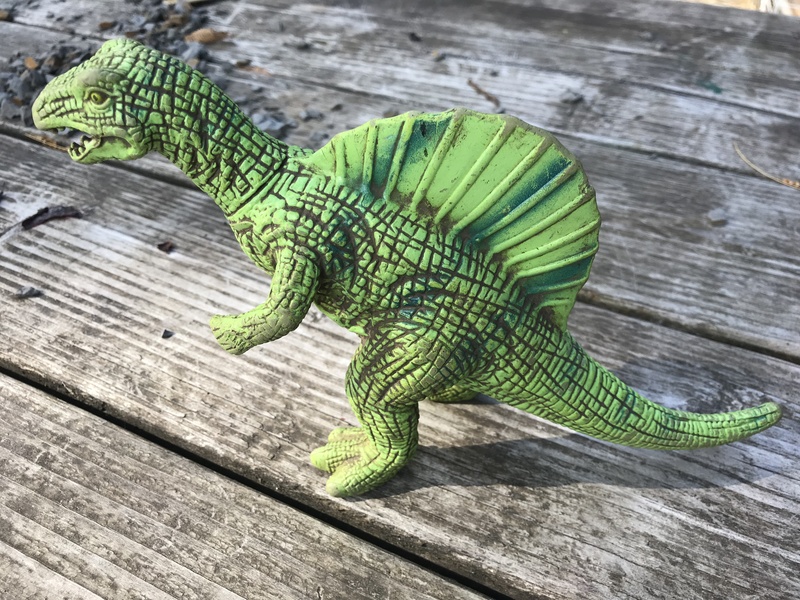 The plastic toy dinosaur pictured here was just one of MANY leaded toys found on a playground at a daycare for young children near Santa Monica, California early in 2018. A mom at the school had asked me to come look around for potential hazards and my eyes went right to the dozens (if not a hundred or more) of “old” toys that were deemed crappy enough (yet sturdy enough) to be left outside day after day and therefore suitable for use on the playground. This included a whole flock of older plastic dinosaurs of all sizes. As expected, many of the plastic dinosaurs positive for lead when tested with an XRF instrument. Even in high-end, fancy private schools many of the toys and other learning aids are donated by well-intentioned families who no longer use these items in their home. As a result, these toys are often older (pre-dating the new consumer protection laws ushered in with the Consumer Product Safety Improvement Act of 2008), well-worn, and also possibly highly leaded. The dinosaur pictured here did, in fact, test VERY HIGH for lead (over 8,000 ppm), and was also positive for cadmium, which is a known carcinogen. Please scroll down below the picture to see the exact full XRF readings for the dino pictured. The amount of lead that is considered toxic in a newly manufactured item intended for use by children is anything that is positive for 90 ppm lead or higher in the paint or coating or anything that is 100 ppm lead or higher in the substrate. My simple solution for schools – and parents – is don’t allow donated toys unless they have a manufacture date stamped or permanently impressed into the bottom; ideally, this date needs to be 2010 or newer. If there is no date (and especially if there is also no manufacturer indicated), the school should not accept the toy. Alternately, absent a volunteer to ensure compliance with item #1, the school should only buy newly manufactured toys from reputable manufacturers AND vendors (be on the lookout for and avoid vendors who sell cheap knock-offs — which can often initially appear identical – down to fake labels — the suspiciously low price being the red flag!). This image shows all of the recalled Thomas the Tank Engine trains from the June 2007 recall. Back in 2009, in my own kiddos’ daycare — which was a very fancy private Jewish daycare (over in Portland’s fancy west side hills, – back in the days before I involuntarily took a vow of poverty, lol!) I found recalled [high-lead] Thomas The Tank Engine trains in the train tables in the baby and toddler rooms. This is not an uncommon occurrence; after a recall makes a big splash in the news (the Thomas trains were recalled in June of 2007), the specific concern gradually fades from the both the headlines and people’s consciousness (and the original recall almost NEVER reaches all of the customers who bought the recalled products — especially folks like grandparents, who might not be staying on top of every single recall the way some new moms tend to these days!) As a result those recalled toys often end up being donated to daycares and schools when the family outgrows them, and the donor doesn’t realize they are giving a toxic item to the school. 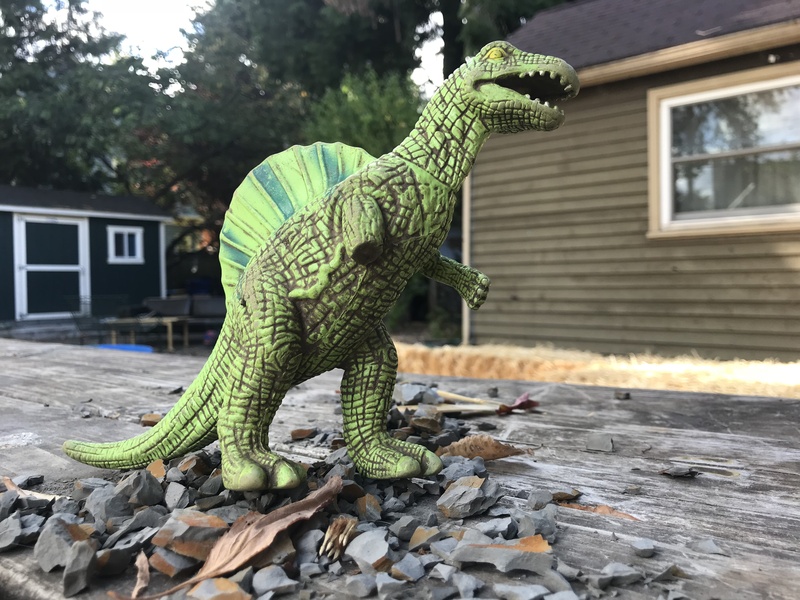 Given the focus and concern on plastic dinosaurs in this post (and the fact that most plastic dinosaurs are made in China and the Thomas trains were made in China too!) I wanted to make sure to state that contrary to a popular impression, the “Made in China” label is not necessarily a predictor of anything bad these days (post 2010). The concern in each of these cases is not the country of origin, but the year made. Please don’t reflexively reject toys for lead concerns simply because they are manufactured in China. China is home to the largest manufacturing sector in the world, and thanks to current regulatory standards with a big focus on screening imported goods, in my experience most modern toys from China are lead-free or lead-safe; conversely, many toys that are high-lead are not manufactured in China today. To see more “Made In China” items I have tested, click here. Thank you for reading and for sharing this post! Please consider chipping in something in support of my independent consumer goods testing and advocacy work. Any amount helps. Contributions help me do this testing and also help to keep this information free and available to the public here on my blog (so I don’t have to put all of my content behind a paywall!) Thank you! Chip In Link. 2 Responses to #AskTamara: Should I be worried about the possibility of lead in the sandbox toys at my child’s school? I’m assuming they are safe. They were a gift (bought off Amazon I believe) and they seem to look good! I do always wonder about people trying to find cheaper alternative for the same item on Amazon though.